Classifying large volumes of documents and accurately extracting information from them is no small task. And it’s certainly not a task that can be adequately handled through manual processes that are slow, error-prone and expensive. 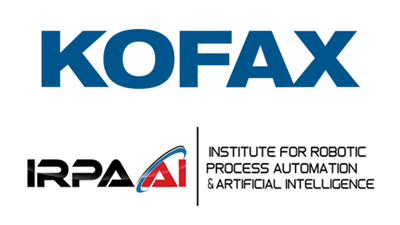 Kofax Transformation™ automates and accelerates document processing, making it possible to reduce labor costs, increase productivity and push document processing speed and accuracy to their optimal states. Kofax Transformation automates the understanding of any document type and the data on those documents for later processing or storage. 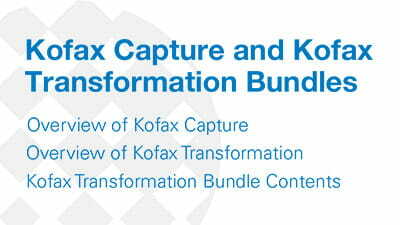 With the Kofax Capture and Kofax Transformation system for capturing and processing structured, semi-structured and unstructured documents, you can realize a new level of efficiency in your document capture processes and avoid costly integrations. 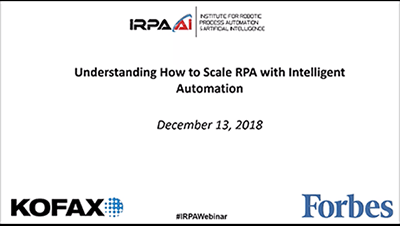 Dramatically increase productivity and accelerate business processes by removing the need for manual document classification, separation and extraction. Process more transactions each day easily and efficiently and improve information throughout your organization. Early notification of potential issues means you can keep your system running smoothly and put out fires before they start. Monitor your system’s performance, gather detailed information regarding classification and recognition rates and view statistics per user, field, document type and average over user selectable time periods. Accelerated Document Capture. Optimized Productivity. From medical claims to mortgage processing to customer onboarding, Kofax Transformation revolutionizes the way you process documents. With one platform for capturing any and all document types, you’ll optimize speed, accuracy, productivity and data visibility. Automatically extract data from U.S. CMS-1500, UB-04 and other claim forms to increase claims throughput and auto-adjudication rates. Extract and validate header, amount and line-item data from supplier invoices and match to vendor and PO data in ERP systems to cut manual data entry costs and reduce processing exceptions. Automatically extract sales order data from scanned and faxed POs and validate against catalogue databases, ensuring correct shipments and reducing the order-to-cash cycle. Automatically classify and extract pertinent information from new account applications, driver licenses, other forms of identification, enrollment forms, and more, and send them to back-end systems for immediate processing. Discover and identify previously unknown documents from file shares, including text-rich documents, for subsequent data extraction. Classify and extract hundreds of document types used in the mortgage process—application, underwriting, closing, and post-closing — and dramatically reduce the time and cost to close. Classify all incoming mail as it enters the organization so it can be routed via workflow to departments and individuals, eliminating manual document sorting. Classify multiple form types (applications, claims, taxes, census) and revisions and extract handprint and barcode data from them to eliminate document sorting and reduce data entry. Identify individual document types within large packets or folders without separator sheets, reducing document preparation and folder review costs. Classify documents and extract multiple index fields to enable reliable posting to a document management system, as well as easy retrieval.